The journey to #TransformFreetown has begun! Freetown City Council - The journey to #TransformFreetown has begun! 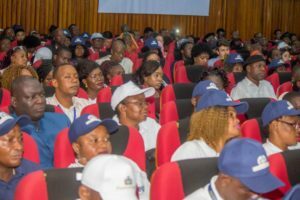 Transform Freetown, the Freetown City Council’s three year priority plan, was launched on the 24th January 2019, at the Miatta Conference Center. 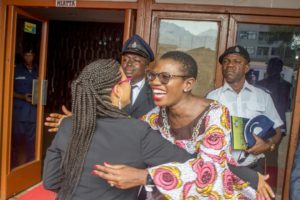 The development of the Transform Freetown Plan is one of many manifestations of the Mayor’s commitment to improving the lives of all residents in Freetown – a commitment she had emphasized during her campaign. 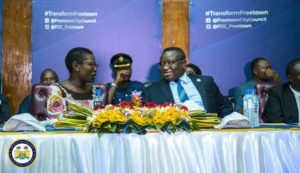 The launch of the Transform Freetown plan and its eleven priority sectors was a product of eight months of hard work by both the Council and the members of the Sector Working Groups. The priority sectors were developed from community needs assessment consultations that were validated by community leaders. Sector Working Groups introduced technical expertise and experience from both public and private sector players to develop targets, and initiatives to achieve those targets. This top-down bottom-up strategy brings a fresh approach to agenda-setting and it has been widely commended nationally and internationally. At the launch, World Bank Country Manager, Gayle Martin, made it clear that the World Bank completely supports the “Transform Freetown” Plan. The Deputy Minister of Local Government and Rural Development, Hon. Philip Tondoneh, promised to support the Council as long as its goals align with the central government. The Transform Freetown Plan’s priorities span a wide spectrum of issues, which include urban planning, sanitation, environmental management, job creation, revenue mobilization and education. Initiatives in each of the eleven priority areas will involve major work to give the image of the city and the lives of its residents a facelift. Over the next three years, the Council will facilitate the construction of 5000 meters of new community built drainages and the planting of at least 1000 trees in flood prone areas to reduce flooding during the rainy season, and promote the proper disposal of waste, amongst other things. The Transform Freetown Plan brings the political will needed to develop Freetown socially and economically. Her Worship the Mayor, Yvonne Aki-Sawyerr OBE, delivered a noteworthy speech at the launch, during which she reiterated her desire to return Freetown to its former glory as the destination in West Africa and extended her thanks to the government for their sincere interest in devolution and collaboration and repeating her willingness to work together for the good of Freetown. 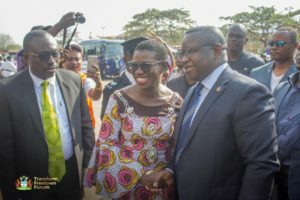 “It is my job to make sure that young people looking for a job don’t feel like they have to leave!” she announced, pointing to her upcoming “Discover Freetown” initiative, that is meant to stimulate the city’s tourism industry and facilitate the creation of at least 4,000 jobs in the industry. In his keynote address, His Excellency the President Rtd. 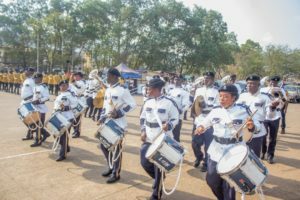 Brigadier Dr. Julius Maada Bio echoed this tone of collaboration, noting that the initiative follows a similar path to the New Direction. “My government is committed to working for Freetown and in making our Freetown a better city for all of us,” he proclaimed. The Council now needs the cooperation of Freetown’s residents to successfully implement the Plan and achieve its goals, especially the Council’s revenue mobilization targets. The Minister of Finance, Hon. Jacob Jusu Saffa, at the launch, pressed strongly that it is the responsibility of all Freetonians, whether born, raised or transplanted to the city, to pay their taxes and help the city. Moving forward, the Council will undertake performance and monitoring as the Sector Working Groups implement the plan on behalf of the Council. Freetonians can learn more about Transform Freetown here. The Council will continue working with the organizations that have committed to help us bring this plan to a reality. We appreciate those that have so far made financial contributions towards the initiatives in the Transform Freetown Plan – Irish Aid, the EU, Cordaid, and CRS. We are grateful to all those that have pledged to help and we are looking forward to holding ourselves accountable to them.